Formosa Lily | Gurney's Seed & Nursery Co. Fills the air with fragrance. It has spectacular large flowers with strong, sweet fragrance and clean white color. Last lily to bloom (August/ September, when gardens can lack interest). Will re-seed and bloom in two years from seed. Easy to grow! So well adapted to the South that it is naturalized in some areas. 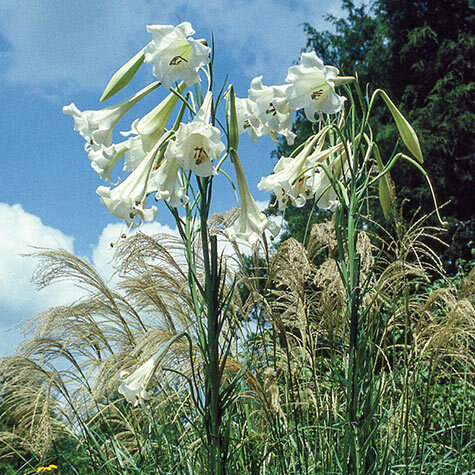 Blooms at 5–7' tall. Plant bulb in spring for first year fall bloom. Potted. Zones 6–9. Foliage: Dark green linear leaves, each 3-8 in (7-20 cm) long. Pruning: Leave stem standing as long as leaves are green. Once brown may be cut back. Comments: It has spectacular large flowers with strong, sweet fragrance and clean white color. Last lily to bloom (August/ September, when gardens can lack interest). Will re-seed and bloom in two years from seed. Easy to grow! So well adapted to the South that it is naturalized in some areas. Blooms at 5-7' tall. Plant bulb in spring for first year fall bloom.